Being in a car accident can be scary. You want to make sure you handle everything efficiently. Plus, you will want to get your car fixed as soon as possible. You will want to call emergency services so that the police can come out. They can start an investigation, ticket any responsible parties, and provide you with a police report. We will then want to inform insurance as to what happened. At some point, you will want to get your car repaired. This may be a few minor issues or something more dramatic. Either way, you will want to follow the protocol set forth by your insurance company. This may also include meeting with an adjuster. Schedule an appointment with our service center at Ferrari of Austin today. 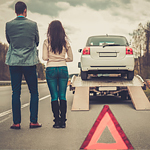 We can handle various repairs to get you back in the road quickly.